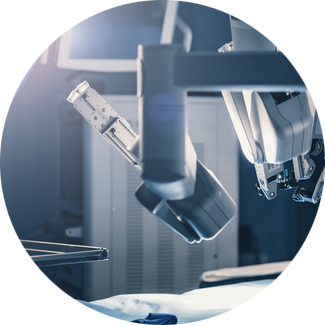 Robotic surgery refers to procedures that are minimally invasive, and performed with the use of advanced surgical robots. During these types of procedures, your surgeon will make tiny incisions at the site of surgery, through which small surgical instruments are inserted. With the use of a surgical system known as the da Vinci robot, the procedure can be conducted with an extremely high level of precision. Tiny surgical tools, as well as a high-definition camera, are mounted onto the machine’s robotic arms. The camera allows your surgeon to see the inside of the body in detail, while the tiny instruments are able to bend and rotate much more than the human hand, allowing for complete accuracy. During the procedure, your surgeon will control the surgical instruments and the camera while looking at a high-definition monitor. The machine works by translating the surgeon’s hand movements into precise movements of the surgical tools. Because of the advanced nature of this technology, the surgeon is able to view the inside of the body in HD 3D detail. Because robotic surgery is minimally invasive, patients experience very little scarring and generally have a much quicker recovery time. There is also generally less pain, a greatly reduced risk of infection, and significantly less blood loss. The technique generally has improved oncological and functional (urine continence and sexual function) outcomes.